I have been following the World bank reports for last 4 years and have featured it earlier on this blog as well. India is actually getting worse every year ! Infact, even in comparison to 8 South Asian Countries, India comes 2nd last just above Afghanistan. It is easier to do business in Bhutan, Nepal and Bangladesh as compared to India. 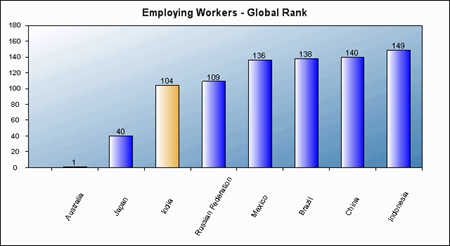 Pakistan, is the easiest country to do business among all South Asian Countries ! 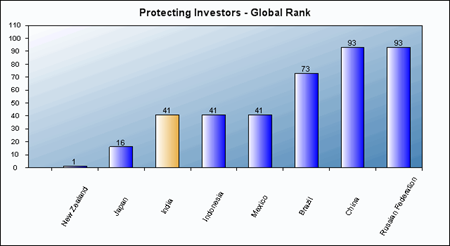 And where does India stand Globally? India ranks 133rd of total 183 countries when it comes to ease of doing Business. It is a shame that over years, instead of getting better, India is becoming worse ! 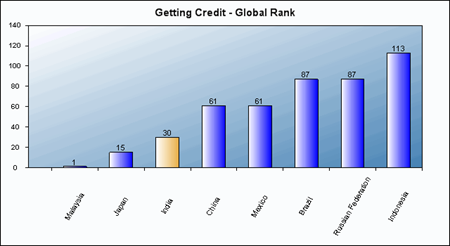 Out of total 183 countries, India was Ranked 120 in 2007, 122 in 2008 and 133 in 2009. 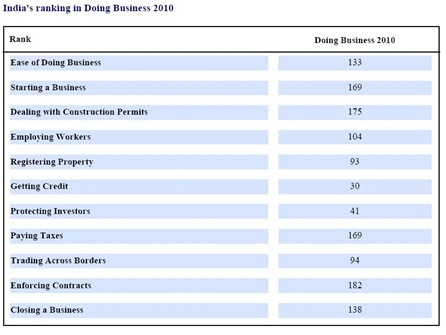 Here are some of the highlights of various areas of doing business as compared to other countries. 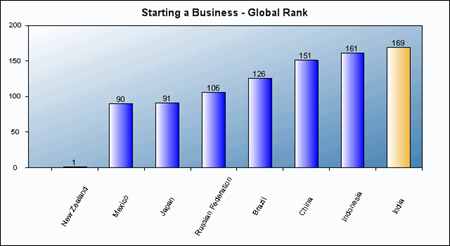 India performs worst here – it takes more cost & money to start a business in India that most of the countries worldwide. India was placed 166th last year, and this year they have fallen further to 169 ! 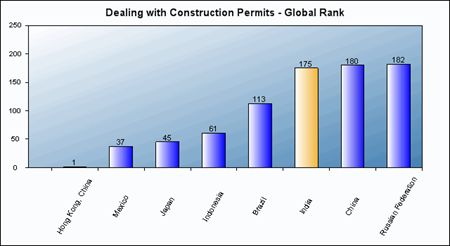 Here we do well (yeah relatively), as we have other BRIC nations faring even worse. 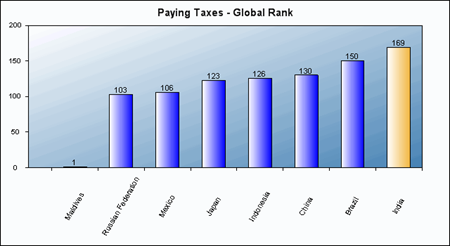 Everyone knows it is extremely difficult to pay taxes in India and the 169th rank is justified. The good news is that, our Finance Minister has launched the Direct Tax Code bill that will make a huge difference when the ranking comes out next. This is one area, I am quite confident, that India will improve in coming years. 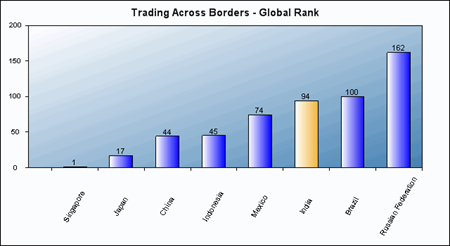 Its difficult to trade across borders compared to half of 183 countries surveyed. Its much easier to do it in China – and why not, China’s economy is heavily dependent on trading across borders ! 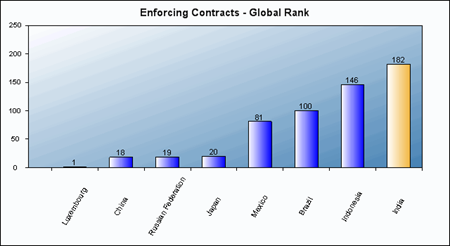 I dont have to say anything here – India ranked at 182 when it comes to enforcing contracts – It just does not happen in India ! Conversely, it happens very well in China. 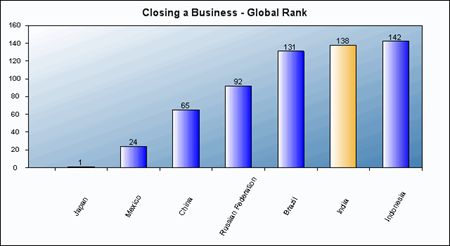 You cannot close your business easily in India – ranked 138th – Think about the difficulties involved in closing the business first, even before you start your business. You can find full reports released by World bank here. Which Type Of Business Should You Incorporate? LLC, OPC, Pvt. Ltd or Others? Can you write a post for us on this… We can feature it on trak.in along with the slideshare presentation that you have pointed out..
Nice article Arun. I stumbled upon this article and really liked it. I guess statistics would have changed by now. I would like to know that do you happen to have same statistics for different states in India? Some of the main problems to start business in India are lack of professionalism and lack of organization also. Corruption is a big problem here. You shouldn’t have to bribe to get everyday things done. If all these can be eliminated, India would be doing so well. I have clients who want to come here but are afraid to come. I personally can bring in a lot of people. India grows so much food but a lot of it is wasted as there is no proper storing mechanism. We No Need to worry, many people are doing paper and numbers business, to get the Foreign Investors to there countries, we only do the ethical business, and true business, thats why if you compare in paper and , if you see reality it is different in India. No need to worry we only do the truly business, TRUE will won oneday. For the business Profit is important, it does not matter which way you get the profilt. But there any some Business are there since CENTURIES which is having TRUE values , still those business are sustaining, because they do ethical and true business. similarly we no need to show in the papers what we don’t have,we pass our feature generations with ethics and true for log losting powers in features, one day people will identify, we have many what they don’t have. We no need to competitive with other countries, if we have self sustainability power ourself and to protect from other countries who want to face ur from social,economical,army, that is enough for us, IF YOUR TRUE YOUR SELF , GOD GIVE THE POWER AUTOMATICALLY. That is what ,how i believe.